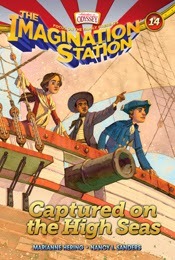 I love the Imagination Station series. I've reviewed most of the books in this series, and I'm not going to link back to all of those reviews. However, Captured on the High Seas by Marianne Hering (Book #14) is the second in a Revolutionary War trilogy, a follow-up to The Redcoats are Coming. You can certainly read this without having read the rest of the series, though. The entire series is great. These books are high action, with both a male and female main character (cousins Patrick and Beth) and they are written around a 2nd-3rd grade reading level. These have been great for my older dyslexic children, and it is also great for my 2nd and 4th graders. This story picks up where #13 left off... Beth and Patrick were leaving, and something happened to the Imagination Station. They found themselves on a ship, about to be captured by the British. Immediately befriended by James, a free black teen. As we find out at the end of the book, the actions James took in this story are historical. Well, not the part where he meets Patrick and Beth and refuses to escape in the Imagination Station. But the rest of the story is based in reality. Like other books in this series, the chapters are short, and almost all end with some sort of cliff-hanger to draw you into the next chapter. That is so important with the kids who struggle especially. I'm pretty sure this was my favorite yet, though Surprise at York Town (the final title in the Revolutionary War trilogy) might top it.